Two years after Congress set a deadline to integrate unmanned aircraft systems into national airspace, Senate lawmakers are pressing the Federal Aviation Administration to speed up its efforts. The FAA Modernization and Reform Act of 2012 established two main drone-related provisions: The agency must integrate small commercial UAS by September 2015, and the agency has the authority to grant exemptions allowing UAS use until a final rule is in place. Congress also required the agency to establish six test sites to allow drone experimentation and testing — something the FAA has done, but under very specific requirements. The letter goes on to recommend that the FAA improve the certificate of authorization process, which allows commercial operators to use drones. Most recently, the FAA granted a COA to the Motion Picture Association of America to allow them to use drones for filming on closed movie sets. “Failure to improve the COA application process and prioritize COA applications to operate within designated UAS test sites raises concerns that the test sites will fail to materialize the way Congress intended and valuable research and testing will be stalled,” the letter said. In addition, the senators said they were “concerned” that the FAA would miss the September 2015 integration deadline, something its inspector general predicted would happen. “We understand the difficulties faced by many federal agencies that lack the resources and staffing necessary to keep up with demand, but in this ever growing area, it is imperative that the FAA work closely with the industry to ensure that it is not creating a burdensome roadblock to innovation and defeating the intent of establishing UAS test sites,” the letter said. In a release, Wyden said he was concerned that proposed regulations could hinder the innovation for the UAS industry. “The FAA needs to act quickly to alleviate these concerns and issue guidelines for developers and operators of unmanned aircraft that will give certainty to the UAS industry and ensure the safety and privacy of Americans,” Wyden said. 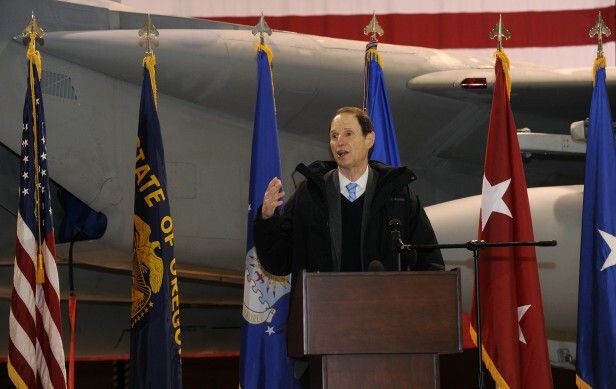 Wyden’s home state of Oregon has three UAS test ranges, which operate under the realm of the University of Alaska’s officially FAA-sanctioned test site. Hoeven, who also has an FAA test site in his home state, said the sites have not lived up to what they were intended to be in the original bill. Hoeven’s North Dakota colleague Heitkamp said in a release that the North Dakota FAA test site is on the forefront of UAS technology. “Even though its test site has been up and running since April, the FAA needs to do more to make its test site program a success, including providing needed flexibility and guidance so private industry can work with test sites to develop UAS technology and strategies. That’s why I’m calling on the FAA to efficiently do its job and provide the most basic and necessary standards this industry needs to take its first steps out of infancy,” she said. UAS technology shows potential for a range of applications, including agricultural development, energy production, and search and rescue missions, Heitkamp said. She added that the technology has already created jobs.